In a review of Martian Quest: The Early Brackett, Paul di Filippo says “Plainly, Brackett was growing with every story she wrote, not yet 30 years old by the volume’s end, with the best yet to come.” Lorelei of the Red Mist: Planetary Romances is where some of that “best” can found. "This welcome volume follows hard on the heels of Martian Quest: The Early Brackett and finds our tough-minded, talented and productive author (1915-1978) at the top of her form, as her richly conceived "inhabitable Solar System" truly becomes a glorious, fully realized milieu for the rousing hybrid adventures she wished to tell. Containing 12 very long stories, plus two separate introductions (by Ray Bradbury and Harry Turtledove) and a concluding essay on SF by Brackett, Lorelei is replete with hard-bitten protagonists with wounded psyches, females both nurturing and malevolent, weird alien life forms, strange planetary environments, danger, treachery, camaraderie and even spiritual epiphanies. In short, this book holds the essence of SF—at least, the essence of one very important school of it. In "The Blue Behemoth," a down-and-out circus relies on a monster named Gertrude as its star attraction. But one day Gertrude's true nature manifests itself. ... "Thralls of the Endless Night" details the fate of a crash-landed colony whose citizens have forgotten their heritage and must face the threat of extinction on a world they never intended to inhabit. The seedy pair of Mouse and Ciaran, lovers and rogues, must face androids and brutish "Kalds" in order to steal their prize from an immortal boy in "The Jewel of Bas." Spaceships go to their doom in "The Veil of Astellar," but we learn the Veil's not a natural hazard, but a lure from another dimension. "Terror Out of Space" finds seductive aliens arriving on Venus; meanwhile 3,800 wanderers search for a place to call home in "The Vanishing Venusians." A crummy thief named Hugh Starke finds himself transferred to the body of a warrior named Conan, fighting a war of strange factions, in the title story, co-written with Bradbury. And to save himself, David Heath must confront the mysterious phenomenon known as "the Moonfire" in "The Moon That Vanished." Burk Winters learns that his tendency toward atavism has deadly consequences in "The Beast-Jewel of Mars." Ready to plunder any native ruins, Bert Quintal finds his undoing when he encounters the "People of the Sky" in "Quest of the Starhope." "The Lake of the Gone Forever" is the lure that draws Rand Conway into peril, while for Tony Harrah it's "The Dancing Girl of Ganymede." The currents that converge into the Sea of Brackett, creating the salty savor of her prose, are many, and are both literary and extra-literary. Among the former, we can tease out her admiration for such writers as A. Merritt, Robert E. Howard, Dashiell Hammett and a dozen other pulpsters who trafficked in over-the-top adventure. Fascinated equally by scenes of otherworldly beauty, civilized decadence, barbarian vigor and naturalistic lowlife criminality, Brackett was continually adjusting her personal equation of all these factors to produce stories showcasing varying ratios of these elements. In one tale, such as "Thralls of the Endless Night," decadence and half-remembered legends take precedence. "Terror Out of Space" verges toward Lovecraftian horror. "The Jewel of Bas" hews more toward sword and sorcery. And then some stories strike all the mingled notes perfectly, producing that unique Brackett fusion. My favorite in this volume is "The Veil of Astellar," which features spaceflight, immortality, an alien succubus, self-sacrifice and virginal innocence. As for extra-literary influences, the primary one is the cinema. Brackett was saturated with the products of Tinseltown, possessing a naturally cinematic narrative voice and sensibility. Like Will Eisner, who modeled many of his femmes fatales on Hollywood starlets, I'm convinced Brackett envisioned Humphrey Bogart as practically all of her leading men. We also have to consider the role of current events in her fiction. The 1940s arguably marked the last time our globe seemed to possess untouched exotic locales. Exploits of explorers such as Frank Buck, the animal collector, could still resonate. Orientalism still held sway. The notion of undiscovered lands seemed at least barely plausible. 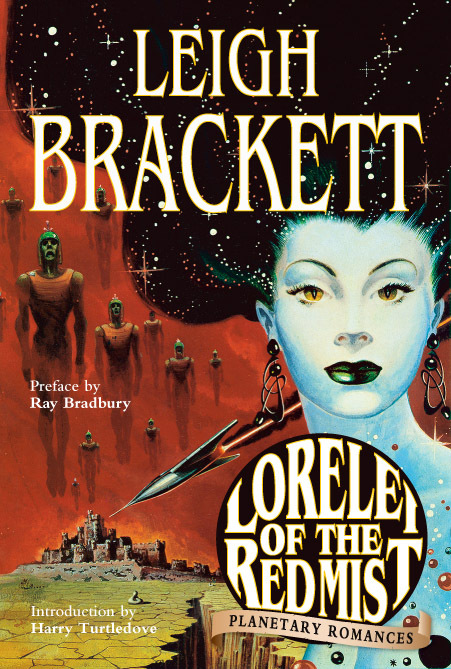 Brackett took these keenly felt romantic terrestrial notions and transplanted them to other worlds, in the process magnifying and bejeweling all that was alluring and mysterious about our own planet. In this sense, her seemingly outrageous fantasies resonated even more strongly on a subconscious level, as she fed her readers the outre environments that they sensed lurked just beyond America's borders, "beyond the fields we know." As always, a Haffner Press book is a sturdy, durable, delightful objet d'art, and a bargain, from its beautiful Freas cover and endpapers to the heavy stock of its pages.